An informative, colorful, comprehensive guide to invasive species that are currently endangering native habitats in the region. 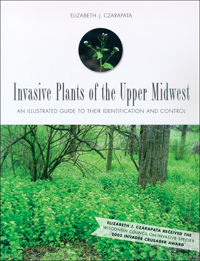 Elizabeth J. Czarapata was the Winner of the Wisconsin Council on Invasive Species 2005 Invader Crusader Award. This book will be an essential resource for land managers, nature lovers, property owners, farmers, landscapers, educators, botanists, foresters, and gardeners. Invasive plants are a growing threat to ecosystems everywhere. Often originating in distant climes, they spread to woodlands, wetlands, prairies, roadsides, and backyards that lack the biological controls that kept these plants in check in their homelands. This guide includes more than 250 color photos that will help identify problem trees, shrubs, vines, grasses, sedges, and herbaceous plants (including aquatic invaders). The text offers further details of plant identification; manual, mechanical, biological, and chemical control techniques; information and advice about herbicides; and suggestions for related ecological restoration and community education efforts. Also included are a glossary, a matrix of existing and potential invasive species in the Upper Midwest, an index with both scientific and common plant names, advice on agencies to contact with questions, and other resources. The information has been carefully reviewed by staffs of the Wisconsin Department of Natural Resources Bureau of Endangered Resources and the University of WisconsinMadison Arboretum, and other invasive plant experts. "Here are the practical information and photographs people need to identify and control the ruinous invasive plants that are changing the landscape of the Midwest." Elizabeth J. Czarapata (19502003) was director of the Weed-Out Program of the Park People of Milwaukee County, a member of the Wild Ones Natural Landscapers and the Invasive Plants Association of Wisconsin, and the founder of the Wind Lake Environmental Club.